Feeling really excited about seeing these guys live, I hadn’t seen them in such a long time since the days ZP used to front the band, due to other obligations I always seemed to miss their shows when they came around, so when the opportunity arose to go out into Manchester to catch them I snapped it up. I couldn’t wait to see and hear the band again, and see how their new front-man Marc Hudson fits in with the band! Suffice to say, they didn’t disappoint! Dragonforce back with their latest album, album #7 ‘Reaching Into Infinity’, and what an almighty album it is! I managed to pin down lead guitarist Herman Li before the show for a chat, and he is just how I remembered him to be, open, honest and quite frank about topics. Herman Li is one of 2 lead guitarists for the Power Metal band Dragonforce, who are one of the leading bands of their genre. Herman Li’s stage performance is nothing more than blistering, with his lightning licks, harmonious melodies and power charging riffs – this guy know how to put on one hell of a show! 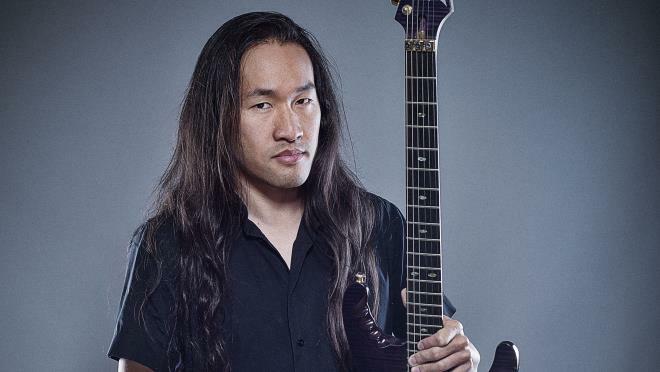 Read on to see what Herman Li had to say…. Hey Herman how are you doing? I’m very good how are you? I’m all the better for being here catching up with you guys again, its been a long time! So ‘Reaching to Infinity’ was released in May this year, released with EarMusic in Europe, and Metal Blade Records in North America. 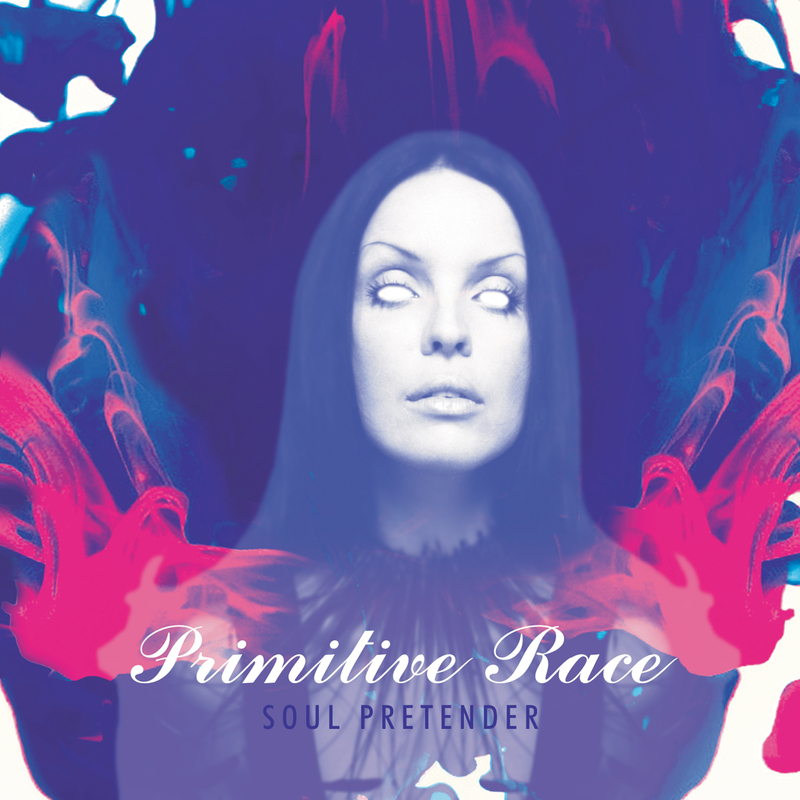 The album produced by Jens Bogren known for working with Opeth, Sepultura and Dimmu Bogir just to name a few. You guys have been touring extensively from Japan, China and now your here in the UK as part of your European Tour, how has the tour been so far? We are at the beginning of our European tour, starting in the UK. We have done lots shows all over the world, but here we are back in the UK. Majority of the shows have been sold out, its been a lot of fun. Its crazy the doors don’t open here for another hour and a half and there are people queuing up round the block for you already, you have some really dedicated fans. Yea it’s always great to come back and play the UK, the fans here are great. Even though most of us live in the UK now in the band it doesn’t mean we play here often, we play here every few years. We just tour for so long in other parts of the world we might do so many tour dates in America or Japan/China, by the time we get back to the UK a year or more has passed, it’s just the way it works out sometimes. Can you tell us about the album name and the inspiration behind it? Reaching Into Infinity it’s talking about music and how music can reach people in all different ways, and the ‘infinity’ means timeless like a portal like the cover, like metal music is timeless with never-ending energies. There is just a timelessness of rock and metal music. Do you think that this album has progressed from your last album, to me it sounds almost like a follow on from the last album, almost like this is the second part of ‘Maximum Overload’, is this how you wanted it to sound like a continuation? Every album I believe we have progressed, but I think it depends on who’s listening to the album as everyone has different perspectives on it. For me every album is a progression, its like computer technology, your next one is always going to be faster than your last. This album is an evolution of the last album, so if anyone asks me this on the next album I will more than likely give the same answer. I’d say that we did like a continuation up to ‘Ultra Beatdown’ then we did a reset. When Marc joined the band we did a shift and brought it back a little bit so the music wasn’t too insane, we slowed things down a little bit but not too much so we sounded differently. We slowed things down and started doing 8 minute songs. 8 minutes, yea not too bad I suppose compared to your wondrous 11 minute masterpiece ‘The Edge Of The World’. You guys released a special edition for ‘Reaching Into Infinity’ which features live footage from Woodstock Festival in Poland, the 4 camera angle really gives you that up close feel so you can see all areas of the stage, how did you guys find this? Who thought up of this 4 split screen concept? Show wise it was really good. Then when we got the footage back, we talked about doing bonus stuff, and we had already previously released a live Blu Ray DVD, so we didnt want to do that again we wanted to try something new we wanted to give the fans something special, so we made the 4 split video. I edited it from the different camera angles so the fans got all angles to watch. You did all the editing yourself? Yea I do a lot of the video editing, I edited the whole DVD live footage. That’s really impressive, how do you find time when you tour so much? I’m a crazy person you know, a complete control freak when it comes to things like that, if I want something to look or be done a specific way I have to do it. I did the Blu Ray while we were out on tour so that kept me busy in my spare time. Have you got any crazy stories from on tour that you can tell us about? Ok lets re phrase it, what’s craziest thing a fans ever given you while you have been on tour? When we go to places like Japan the fans out there are crazy, they are like our super fans. They lavish us with gifts. I told all the band mates you may as well go over there with an empty suitcase because the airlines will make you pay extra and we don’t get allowances for excess luggage, and the Japanese fans go crazy with gifts. Do you find the Japanese fans are the most affectionate and loyal, as in they will come to every show and buy all your merch and follow you relentlessly across social media. They are definitely more loyal. As a band we make the effort and try to play in more places around the world and some of the fans we met in Japan we have seen at others shows around the world, they will fly around the world to come and see us, its crazy, but we totally respect that. Some people now just tick bands off like a bucket list, they see you once then don’t bother again because they think that streaming a gig rather than coming to a gig and giving the band their full support is OK because they have already seen them, that’s just my opinion anyway. You guys did a Death cover on the special edition which totally threw me, I wasn’t expecting it, what made you guys decide to do this? Why not, that’s the thing, it’s just a part of trying something new and surprising people. We did it on the previous album we did ‘the ring of fire’, then we said maybe we shouldn’t do another cover at all then we ended up doing the Death cover because no one would expect us to do a Death cover. No, not at all, totally shocked me but I thought it was great, I thought this is so different its weird but in a good way. That’s the reaction we are going for, trying out new things. After the European tour we are done touring this album, we are going to have some down time. It used to be that we would start in the UK and finish in the UK and maybe tour America 2 or 3 times, but now its like one tour in America one tour in japan one tour in Europe and then we are done, and if you don’t get out to see us then you wont see us until the next tour. And with the amount of bands touring these days, it’s harder for other bands to book tours. What can we expect from tonight’s show? 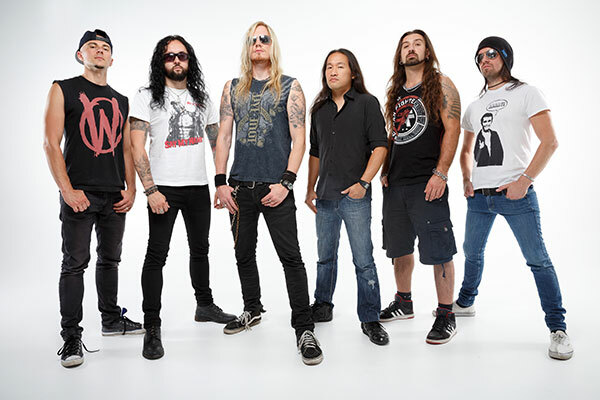 Like every Dragonforce show its going to be a high energy packed show. We make use of everything we can get, just like the albums we are always improving and that goes for live shows too. A continuous evolution in the live show. Is there anything you would like to say to your fans and followers? No, this used to be a good question in the past before social media, because now if you want to say something to your fans you can just post it or tweet it. I suppose there are ups and downs to social media. Personally I think social media is horrible, I only do it because I have to. I’d be happy never using it again. Do you find it a little intrusive especially with being in such a well-known band? I don’t expect people to like my band page you either like us or you don’t, I wont be offended. Some people make use of it and enjoy it like a hobby, like some people enjoy horses or some people enjoy driving cars. I just don’t get the interest in sitting there and swiping your phone left or right for hours on end, there’s so many productive things you can do with your time. Do you not think it’s a good platform for newer bands to get their music out there and heard? Not really, because everyone is using social media you can hardly get an edge on it. Back in the days of MySpace was different but now everyone uses social media, and they are all owned by the big corporate companies who are making money out of people. In the beginning people can’t quite work out what to do, so now you have your social media and your followers, and the whole thing is rigged anyway, you can post stuff and your followers wont see it. It’s all controlled by the corporate companies systems who controls everything, which means you have to buy into which ever social media outlet you’re using so more people can see your posts. You build up this fan base on social media, but your actually being controlled under the mercy of the computer systems that decides what gets seen and what doesn’t. I see so many young bands depending on social media, what these bands need to do is get their own website, design it on a server, have your own thing and your own mailing list. Social media is just giving a fake illusion making people believe certain bands are more popular, but now you can buy likes to look more popular, and that’s the wrong way to things because then you’re giving out a false image. So what do you think needs to happen then? You need to get out there and play live in front of people, which is more important. You need to build up a good mailing list in order to create a good following, all done from your own website where you control everything and can monitor your followers through all through all your own stats/page visitors. Reach is important. Twitter, Instagram, Facebook I understand you have to do it, but don’t depend on it. In music there’s no 1 thing that will seal the deal, you have to do everything and cover all bases. I think we will leave it there for today, thank you so much for your time today, and I can’t wait to see you guys on stage.